Pick the pots. Most plants aren't fussy about the type of pot they grow in. All they want is enough space to spread their roots and a few good drainage holes to allow for drainage. Choose pots and containers in a variety of materials, such as terra-cotta, ceramic, wood and plastic. Choose the right soil. Fill containers with a good commercial potting soil, which should include some of the following: peat moss, compost, perlite, vermiculite and/or rotted manure. Pick healthy plants. You can grow almost anything in a container, even trees and shrubs in a large enough pot. Choose a variety of flowers, vegetables or herbs—and enjoy the bounty. Match light conditions. When selecting plants, read the tags before you make a purchase so that you know whether they grow best in sun or shade. Top annuals for sun include petunias, geraniums and verbena. Begonias and impatiens do well in shade. All vegetables and herbs need full sun. Create a layered look. Create a varied landscape by planting tall, showy plants, bushy medium-sized plants, and trailing blooming plants in your containers. Water often. Container plants need more frequent watering than those in a garden. Water whenever the soil surface feels dry to the touch. During hot, sunny periods, you may have to irrigate every day, especially hanging baskets. Fertilize regularly. Some potting soils have slow-release fertilizer mixed in, but it's still a good idea to add a few drops of liquid fertilizer every time you water. 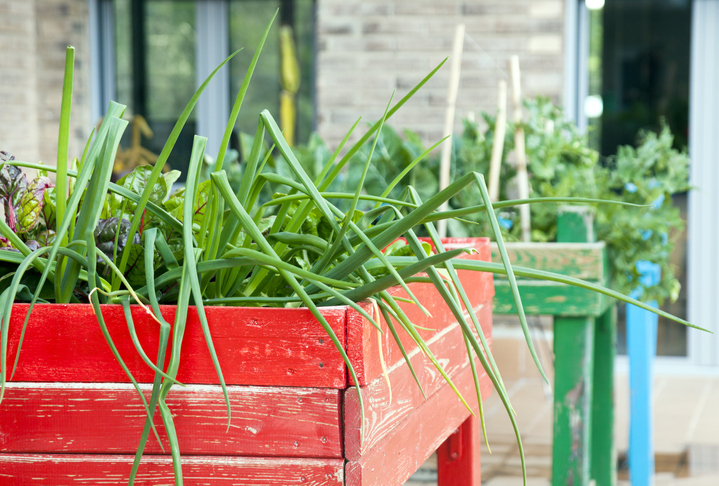 Flowers and veggies, especially, will thrive with an extra dose of plant food. Remove faded blooms. Annual and perennial flowers look better when old, faded blooms are removed. The process encourages new growth. Renew and replace. Even with excellent care, some annuals and perennials look tired by late summer. Remove them from the pot and pop in one or two replacements. Clean up before winter. In colder areas, frost marks the end of the gardening season. Remove annuals and vegetables when they die, and empty your containers.